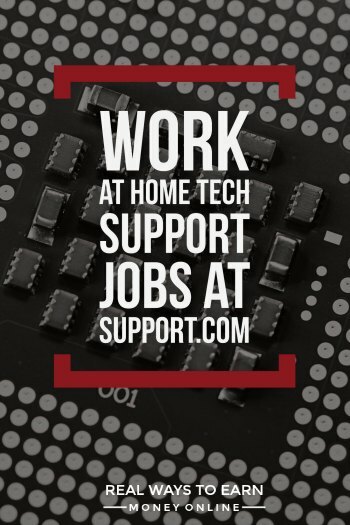 Support.com Jobs – Work at Home Tech Support Positions! Published May 9, 2013 By Anna T. This post may contain affiliate links. Regardless, I only recommend sites I've researched and/or used and trust. Support.com is a company frequently hiring for work from home tech support. At one time they did have some sales positions available that were also work from home, but unfortunately they shipped these jobs overseas. 🙁 I despise when that happens! Support.com. (NASDAQ: SPRT) provides online technology services to consumers and small businesses. We provide a world class customer experience by using an innovative model that combines a cloud-based technology platform with a fully distributed workforce. Support.com is defining a new category of technology-enabled services and growing rapidly each year! If you have at least some tech support background and are pretty good at fixing computers when they tear up or setting up home networks, you may have what it takes to work for Support. Currently they have two different work from home tech support openings, which I will describe below. It looks like the tech support jobs are US only. The remote services technician is more entry level than the other position, personal technology expert. Basically what you do here is help people set up their wireless networks and also do some troubleshooting if necessary. Under “Qualifications,” the job posting states that you need at least a year of experience setting up home networks or some other type of related technical experience. You also need a year of related experience in a customer service environment. Pay is $11 an hour. The personal technology expert is a much more involved role and appears to require a stronger background in technical support. You need at least a few years prior experience and it's a plus if you have taken any tech-related courses or have any certifications. In addition to helping customers set up their wireless connections, you may also be helping them remove computer viruses, answer questions about various software, and also help them deal with internet connection problems. The rate of pay for personal technology experts is not listed, but from what I've read it does pay more than the remote services technician role. Your schedule will be set, but they do have shift bids and you can also swap out with other people on occasion. So if you need a flexible work at home job, this may not be the job for you since they ultimately decide your schedule for you. You have to take a test and have an interview. If you are hired, there will be training that could last a few weeks (Monday through Friday). Note there is also a mandatory background check. You do not need a land line when working at home for Support. Calls go through USB headset. If you don't already own a headset, you'll have to buy one, but they don't have to be expensive. I have a list of good work at home headset options here for pretty much every budget. The feedback for the tech support roles at Support.com varies. A lot of people were really put out with them because they shipped the sales jobs overseas, but the people who are still doing tech support for them here in the states seem to be pretty content with the work from what I've read online. You can see plenty of anonymous reviews of Support.com on Glassdoor if you'd like to read more. Visit the job openings page at Support and click the little box that says “work from home” to narrow your results down to just those openings. This will provide full info on each role and also give you the link you need to apply. Good luck! I left Support.Com a wk and a half ago, after two weeks of training (its 4 wks total training time). I was hired for the RST-Remote Chat Agent position for Office Depot/Office Max. However, I found out on the first day of training that we were NOT just primarily Chat. Apparently we were supposed to be Chat AND Phones! That’s not what I signed up for! But on top of THAT, in a couple of months we were supposed to be taking inbound phone calls for DISH Network! SMH It just wasn’t the WAH job for me as I prefer Chat over phone work. Just my 2 cents. Did you find a Chat only job? I am in search of one as well, just thought I’d ask. The company its self has gone downhill. 60 second auto time Available, Strict QA, Low Pay, Queue all day long. If your interested in being trained somewhat and thrown into a toxic Environment Join our crew! I just recently got hired for the RST position and I’m supposed to start training on Sept 2nd. Can anyone tell me what to expect in training? How many hours of training should I expect per week and what is it like? I also heard that we must pass a test at the end…can anyone tell me what that may consist of? I would appreciate any response and I’m glad to have found this forum. Hannah is correct in regards to the most up to date pay scale. They lowered the pay for the position of RST as well as the testing requirements to get hired. The good- they have decent benefits and the applications like their ticketing system and VPN are better than many WAH companies. The downside is that pretty much the only position for new hires is RST for their primary client (who happens to be rated the worst in customer service in the US) They are going through a lot of changes and at current so the turn over of employees is fairly high, mainly because the level of support given to the new hires is rather lacking. If you don’t mind working in a state of constant policy and procedure changes, usually with little or no warning and you have a decent grasp basic networking and wifi, then it is not too bad. They are definitely trying to focus more on ‘customer service’ instead of the technical aspect, but you do need a bit of both. I’m curious how the process goes, ive done my phone interview as a remote service. The interview was done over the phone, how long do they take to respond with a accept or decline? Do they call you or email you? If you are decline do they even bother contacting you? I left for the same reason Shadow did. If anyone wants more info on the bilingual remote support technican role, I can shed a bit more insight on that. Hmm, so um, yeah I’d like to know more about the bilingual remote support technician role since I just applied and got hired for it yesterday. My training is suppose to start on September 2. I have a job right now at IKEA as a home delivery cashier, but for health reasons (plantar fascitis) I have to resign. I was thinking I should probably work-from-home since, well, I don’t have to stand for 8 hours a day. Some reviews for support.com have been good, but most have been bad. I’m worried I’ve made a terrible choice. Can you shed some light? What is it like working there (specifically the bilingual remote support tech role). Thanks. P.S: I only plan to use this WFH job as a way into the IT industry. I can put it on my resume later. Do they pay weekly or every other week? Every other week, so every 2 weeks. I was offered this job today, so I can clarify a couple points for you. Pay is $9/hr for 5 weeks of training, then $10.25/hr once you hit the floor. They provide you with the USB headset. Congrats! Is that rate of pay for the personal tech expert or the other position, remote services tech? It’s the rate of pay for the Remote Services Tech position. The pay USED to be $11.00/hr ($10.50/hr plus $0.50/hr for “work from home reimbursement”). They have completely eliminated the “Personal Technology Expert” positions since they had a huge 2year deal/contract renewed with Comcast around November 2013. PTE’s still exist, but only those who have been lucky enough to stay as PTE’s have been granted permission to stay with that position. I myself am also a former employee, and one of the reasons that I decided to let it go was because of those constant shift bids. There isn’t much flexibility at all anymore, especially after they held FOUR shift bids in a matter of FOUR months (Jan to Apr 2014)! The most recent bid in April 2014 had more shifts that started LATER on in the day (preferably after 11AM Eastern) due to more demand necessary in their call center (customers seem to need technical support with their computers/Internet in the afternoon/evenings after getting home from work/school, rather than early mornings). Before I left the position, they were requiring everybody to work MINIMUM 45 hour weeks (5 hours of MANDATORY overtime, or else you would get “in trouble” somehow). I just got offered this position and start training in a week. I am going to take college classes in the fall, and I was wondering how flexible they are with school schedules and stuff like that, or if you just have to hope that you get a schedule that works out. Any information would be greatly appreciated. I would definitely give them a heads up now on your school schedule. I don’t really know for sure how flexible they would be with something like that, but I’d say the sooner you let them know, the better just in case they might be willing to set something up for you that would work around it. I currently work for Support.com. They are very supportive but also have a very strict zero tolerance policy on background noise. Also, they have a very strict attendance policy. The training is wonderful though and they prefer customer service over tech support experience just as an FYI. As a former employee, I say it is a great place to work. They are you first, meaning they go out of their way to make sure you comfortable. I enjoyed working there and hopefully look to go back one day. Everything stated is as confirmed: WFM, USB headset etc. A whole lot over time, incentives, stock option, 401k, Medical benefits,and bonuses. There are cons to it but easily avoidable as great customer service training is provided. If you are non technical well be glad for there are numerous folks at Support.com who will guide you.